As I wrote in an earlier post, hubby and I had been to our home in Ichinomiya City during the Golden Week holidays. On 4th May, we visited Nara Koen Park in Nara City of Nara prefecture. Nara Koen Park is a large public park located in the center of the city. It is a beautiful lawn park situated at the foot of Mount Wakakusa (also called Mount Mikasa), and extends about 4 kilometers from east to west and about 2 kilometers from north to south. Ever since the capital moved to Nara in the year 710, the location of the park has flourished historically and culturally. People love this park location and its surroundings for the historical properties and the climate for more than 1300 years now. The present form of the park was established in 1880, and was designated as a place of scenic beauty in 1922. Most of the major tourist spots of Nara City are concentrated in and around this park. The main attractions like Todaiji Temple, Kofukuji Temple, Kasuga Shrine, and Nara National Museum are located either on the edge or surrounded by the park. These temples, shrines, and other historic structures represent the glory of the city over many centuries. Small streams, ponds, and a few gardens like Isuien and Yoshikien add charm to the park scenery. Although the official size of the park is 5020000 square meters, the area including the grounds of the temples and shrines, is as large as 6600000 square meters. Nara Park is very famous for deer, and therefore the park is alternatively also called as Deer Park. The park is home to over 1200 wild Shika deer freely roaming around. These deer graze along the spacious lawns and frolic on the grass of the park. These deer are considered to be messengers of the gods in Shinto religion. They have become a symbol of the city and have been designated as a natural treasure. Tourists and visitors usually buy deer crackers that are sold inside the park and enjoy feeding them to Shika deer. However visitors have to be a bit careful because while these deer are tamer than deer in the wild, they can be quite aggressive if they see tourists holding the deer crackers. On 4th May, hubby and I left our home in Ichinomiya City at about 8 am and walked up to Kaimei Railway Station located near our home. We took two local trains and reached Nagoya Railway Station where we spent about an hour on the second floor terrace of the station building and enjoyed seeing various kinds of colorful flowers at the terrace. Standing at the terrace, we also saw several high rise buildings located right across the station. One of the interesting buildings we saw is named Dai Nagoya Building which is rather new and was rebuilt and completed in 2015. This tower building is 174.7 meters tall with 34 floors above and 4 floors below ground. It was very interesting for us to note that the outer wall of the building is one of the representative works of designer Tokolo Asao who designed the logo emblems of Tokyo 2020 Summer Olympics and Paralympics. Looking at the design patterns on the exterior glass walls of the low-rise part of the building’s facade, we could instantly recognize his signature design style of harmonized geometric pattern that expresses elegance and sophistication. We also saw a stainless steel spiral art sculpture in the plaza area in front of the station. In addition, we saw yet another high rise skyscraper building named Midland Square. It is 247 meters tall, and is the tallest building in Nagoya and the fifth tallest building in Japan. We noted that Midland Square building has two tower structures. One of them is office tower which is a 47 storey, 6 basement level tower structure that opened in 2006. The other one is commercial tower which is a 6 storey, 5 basement level tower structure that opened in 2007. It was very interesting to see all these high rise buildings. At Nagoya Station, we took Tokaido Shinkansen train to travel up to Kyoto. The journey was comfortable and it took us about 40 minutes to reach Kyoto Station. Next we traveled by Kintetsu Kyoto Line (for Nara) train for another 40 minutes and reached Kintetsu Nara Railway Station in Nara City at about 11.30 am. Our seats in the Kintetsu train were in the upstairs section of a double-decker car with comfortable interior facilities. The staircase entrance to the car had a stairwell that created a unique interior layout. From Kintetsu Nara Railway Station, we walked leisurely for about 20 minutes and reached somewhere near the center of Nara Koen Park. Around this central part of the park, we saw many Shika deer freely roaming around. According to the folklore legend, deer from this area were considered sacred due to a visit from Takemikazuchi-no-mikoto, who is one of the four gods of Kasuga Shrine. He was invited from Kashima in Ibaraki, and appeared on Mount Mikasa riding a white deer. From that point onward, the deer were considered divine and sacred here. Although the deer were officially stripped of their divine status after World War II, they are still revered by common people. Nowadays tourists and visitors can purchase deer crackers called Shika-senbei that are sold inside the park and feed them to the deer. Although the deer are tame, they can get aggressive if they see visitors holding deer crackers. We enjoyed walking in the park. It was fun to see these deer graze along the spacious lawns and frolic on the grass of the park. We played with a few of them although initially I was very afraid of them. We also purchased a packet of Shika-senbei and enjoyed feeding the crackers to a few deer. It was so much entertaining. We spent almost an hour with the deer in the park. We continued walking inside the park, and next saw a spacious grassy lawn where many children were busy playing a game of soccer. Towards the eastern side of the grassy lawn, we saw Mount Wakakusa in the background which stands tall at 342 meters above sea level. The mountain has gentle slopes and is like a hill. The mountain is unique in the sense that it is covered with grass. During winter the mountain looks bald and the dead grass is burned in an annual festival known as Yamayaki. The legendary tale of god Takemikazuchi-no-mikoto, as described in the previous paragraph, is based on this mountain. While walking further along the park, we saw a small pond along the way. The pond was aesthetically beautiful and created a beautiful scene among the green landscape. In addition, we also saw the roofs of temples and shrines, and the tips of pagodas peeking through the trees. These enchanting half-hidden views of the rooftops of temples and shrines are actually adjunct features of the landscape and make the park a pleasant space of greenery. Along the way, we also saw a trellis of Wisteria with decorative hanging lavender flower clusters. Walking through the park was really an unforgettable experience for us. Next we visited Todaiji Temple located inside the park premises. It was a wonderful experience to see the world’s largest bronze statue of Daibutsu enshrined inside the world’s largest wooden building named Daibutsuden Hall. I will write about our visit to Todaiji Temple in the next post. Inside Daibutsuden Hall, we bought cute souvenirs like a pair of male and female Omamori amulets for healthy body as well as a keychain with an engraved image of Daibutsu on it. Afterwards, we left Daibutsuden Hall of Todaiji Temple and continued walking inside the park. Just east of the hall, we saw a stone monument of the Pillar of Ashoka. In fact, it is the replica of the Lion Capital of Ashoka or the top portion of the Pillar of Ashoka of Sarnath in India. It is modeled after a holy lion, the symbol of Buddhist teachings. The replica was erected in commemoration of the ‘Thousand-Priests’ Service on the occasion of the Hanamatsuri (Buddha’s birthday) celebration at Daibutsuden Hall on 26 April, 1988. This monument was established to transmit the spirit of the young priests down to posterity. We also saw a golden Sorin located next to the Pillar of Ashoka. Sorin is the finial metal top to a pagoda. This Sorin was created and exhibited on the rooftop of a seven storied pagoda at the site of Expo ’70 fair in Osaka. In fact, the pagoda was recreated in the same appearance and dimensions as the seven storied pagoda that once stood on the Todaiji Temple premises about 1200 years ago. After closing of the exposition fair, the Sorin was reestablished in this place in October 1971. The height of this Sorin is 23.3 meters, which serves as a reminder of the humongous magnitude (height) of the original pagoda. We left Todaiji Temple complex at about 2.30 pm and started walking back in the park premises. We again saw many Shika deer all around in the park. However, this time we noted that almost all the deer were resting or sleeping and refused to eat Shika-senbei crackers from the visitors. They had probably been overfed or had overeaten as it was a holiday season in Japan that time with too many visitors to the park. It was fun to watch a herd of deer resting and sleeping peacefully. Next, we saw many food stalls set up on either side of the main path inside the park premises. They sold fried or grilled food items and cold drinks. We bought Yakisoba along with grilled Yakitori chicken and grilled Kushiyaki beef tongue pieces on skewers. We enjoyed having them while leisurely walking inside the park. 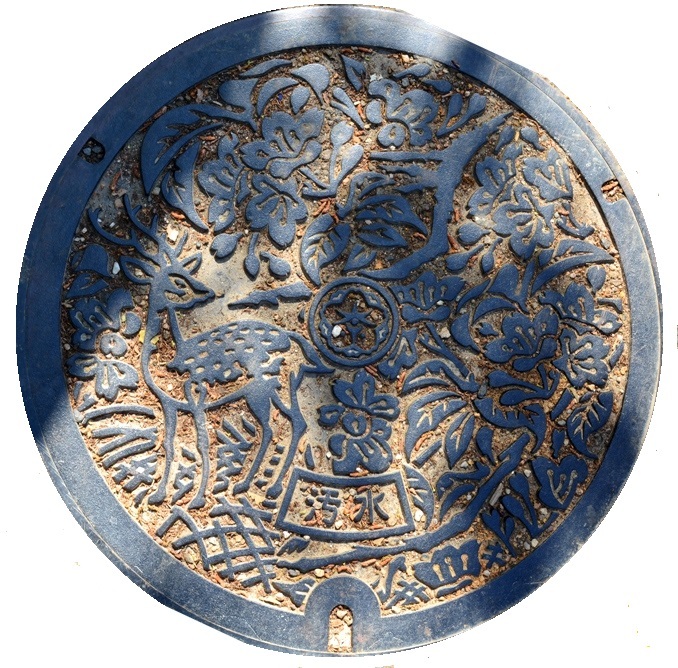 While walking we saw an interesting manhole cover with images of a deer and Sakura flowers, the local fauna and flora for which the park is famous. After having the snacks, we started walking back towards Kintetsu Nara Railway Station. On our way, we visited Kofukuji Temple which is famous for its five-storied wooden pagoda. Kofukuji Temple is also officially located inside Nara Koen Park premises and it was such a wonderful experience to visit this temple of great historical value. I will write about our visit to the temple in a blog post later on. Next, we went to Higashimuki Shopping Arcade, which is a 250-meter-long covered shopping street which extends from the east of Kintetsu Nara Station and Sanjo Dori Street to the south. The arcade has many shops and stores selling souvenirs, arts and crafts, clothes, Kimonos, as well as traditional Japanese sweets and ornaments. We bought a pair of ornamental porcelain Hina dolls and a pair of porcelain cat dolls at one of the souvenir shops. The dolls are so cute. We reached Kintetsu Nara Railway Station at about 5 pm, and took Kintetsu Kyoto Line train to travel up to Kyoto. The journey was comfortable and it took us about 40 minutes to reach Kyoto Railway Station. Next, we traveled by Tokaido Shinkansen train for another 40 minutes and reached Nagoya Station. From there we took yet another local train to reach our home in Ichinomiya City at about 8.30 pm. We were very tired due to travel and sightseeing the entire day but it was really a fun filled outing to Nara Koen Park. Vey lovely and beautiful shots. Enjoyed reading this. Thank you very much for your comment Jyotimoy Sarkar.